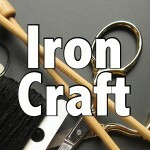 This week for Iron Craft we are getting into the Valentine’s Day mood with the theme of Hearts and Flowers. Last week, I shared a pattern to make chenille heart washcloths, so for this challenge I decided to make some heart-shaped soaps to go with them. Last year I made Lego shaped soaps, so I knew the basics of making shaped soaps. This time I wanted to try something a little more challenging and make a shaped, colored soap within another soap. It was a little trickier than I had thought it would be, I think that was mainly because of the shape of my hearts, but I’ll get more into that below. 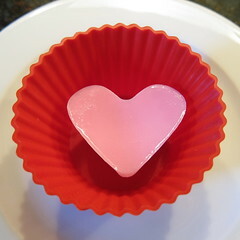 Also I had originally planned on having pink hearts floating in a clear glycerin soup round, but the store was completely sold out of the clear base. Instead I went with this white shea butter soap base. I actually think I like the feel of this soap better and it doesn’t seem to have the sweating problem glycerin soap does. On top of that is has no scent when you start unlike the glycerin which does have a natural scent. Other than the specific soap ingredients, the soap base, coloring and scent, I was able to make these with things I had around the kitchen. First I made the hearts. On a cutting board cut the soap base into small pieces, the smaller the pieces the faster and more consistently it will melt. Place into the microwavable cup. 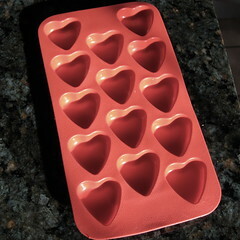 I used the IKEA heart ice cube tray and each heart held 1/2 ounce of soap. Weighing it out meant I melted exactly how much I needed. Microwave the soap on high for 40 seconds. Stir. If it is completely melted you are ready to go, if not microwave in 10 second intervals until it is. (Note: I found with small amounts I didn’t even need 40 seconds. Keep on eye on it, if it starts to boil up, it’s melted) Stir in a few drops of coloring. 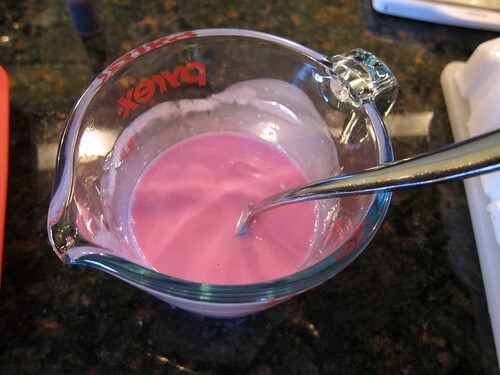 I got this pink with 7 drops in 5 ounces of soap. Then stir in a couple drops of scent if you are using it. Carefully pour the soap into the molds. I wanted mine to be as close to full as possible. Spray the top of the soap lightly with the alcohol, this will get rid of most of the bubbles that have formed. Let cool and solidify. I let mine cool until I can pick it up without anything moving in the molds and finish it in the fridge. Let them get completely cool and hard, otherwise when you pop them out you can make little impressions in them where you press. Pop all your soaps from the molds. They are pretty enough at this point that you could use them as they are. I wanted them in a bigger bar though. Now came the experiments. The IKEA mold gave me a soap that was flat on the bottom, but rounded on the top. 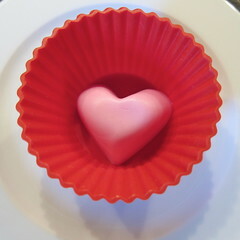 This rounded shape made it a little tricky to set into the cupcake liner and fill around. 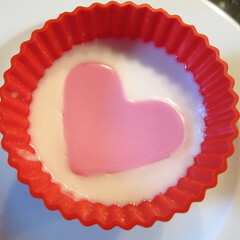 First I tried putting the heart flat side down in the cupcake liner and pouring uncolored, melted soap base around it. I didn’t like how much of the heart I lost at all. 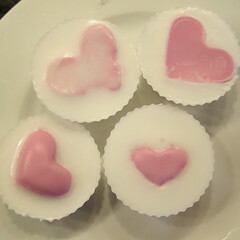 I thought maybe you’d see the flat heart on the bottom, but some of the white soap got underneath too. 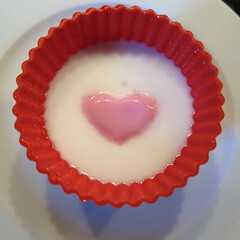 Then a tried putting the heart round side down and pouring the white around it. This had better results, but required a steady hand. First I put a little of the white base on the bottom of the liner. I sprayed my heart on all sides with alcohol and placed it round side down in the center of the liner. 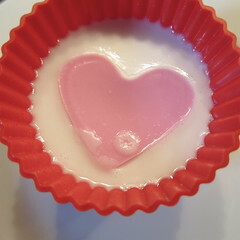 Then poured the base in slowly until it was even with the top of the heart. Finally, the whole thing gets sprayed with more alcohol. You have to be careful not to get any drips of white soap on the heart. Actually, if you do get a few you can scrape them off when the soap is set and then use a little water to remove any scraping marks. Here are a few of my different tries before I got it right. They are of course still usable and after a little use the heart will become clearer in them. I actually like the one with the rounded side of the heart sticking way out of it. 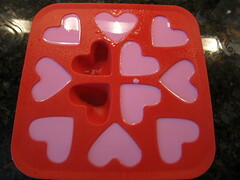 Of course, after I made these I found some heart ice cube trays at Target in the $1 section that I think would work even better. They are flat on both sides and slightly smaller. I think they would lay much nicer in the cupcake liners. Ok, now for the giveaway. Here’s our Valentine to all of you, a set of four heart soaps, 2 rounds and 2 hearts, and two heart washcloths. All you have to do to enter is leave a comment on this post. Make sure to leave a viable email address, so we can contact you if you win. Please only one entry per person. A winner will be chosen randomly on Monday, February 6th. 7 years ago by Kat in Challenges , Craft Projects , Crafts , Iron Craft , Projects | You can follow any responses to this entry through the RSS feed. You can leave a response, or trackback from your own site. These are really cute! And something I think I could even do! These are adorable. One day I look forward to getting the chance to make some soap. 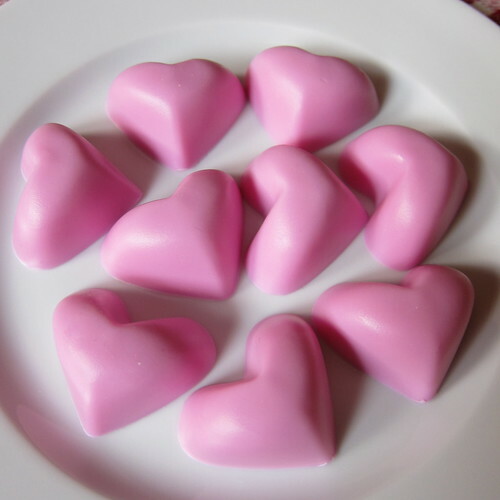 The pink hearts actually look yummy, too, like a candy. These are so pretty! 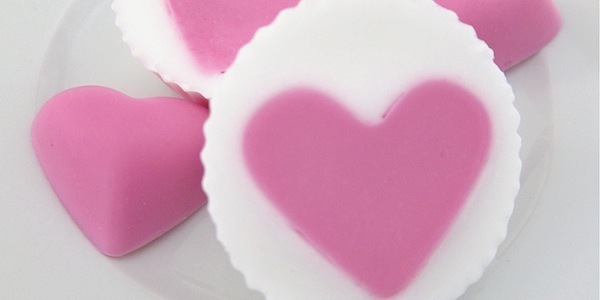 The soaps are so cute….they look like candies…lovely!! Those are neat! I’ve never tried soap-making before. Would be a great way to carry Valentine’s Day even into the bathroom! These are quite pretty. 🙂 I loved being challenged to attempt new things, and your site always makes me want to do even more crafty things. How is this Challenge 3 for Iron Craft, though? I thought that we were doing a challenge every 2 weeks. Wouldn’t that make this still part of Challenge 2? Jeni – You are right it is challenge two…you caught my typo! These are really cute! I especially like the washcloths. These turned out so cute despite all your troubles. Love ’em! That’s so cute! I love ’em! I think they turned out really well! Thanks for sharing what didn’t work as well. We each learn from each other! Thanks for the clear directions & pictures! I’m inspired to try to make my own soap! Wow these are beautiful. I’ve seen the ice cube trays at Ikea but never thought to use them for soap.I’ll have to pick some up next time I’m there as we don’t (yet) have Target in Canada. those are wonderful. I am very interested in how you did lego soaps. I would love to make those. I love the washclothes with this, very cute. I have one question. What is the reason for spraying alcohol on all sides of the heart before placing them in the second part of the soap? The alcohol is supposed to help the help the two additions of soap adhere to each other. Without it they just slide apart. We also use alcohol to remove bubbles. I’ve always wanted to try making soap stuff. You make it seem do able. Thank you. What a cute valentine project. I really like that you show the no so perfect ones along with the perfect ones. It gives all hope that we can do the craft too! I very much enjoyed this post. I think I’ll be trying this one. This was my first visit —but I’ll be back!! Thanks! I think these will be fun to make and give. I just wanted you to know that after having to retire because of illness, I started crafting for the first time in my life. I have learned to do flowers real well, even bows. But… when I got brave enough to get into the candle making and soaps, well, most of mine looked like they got run over by a truck! Guess it takes more patience than I have. 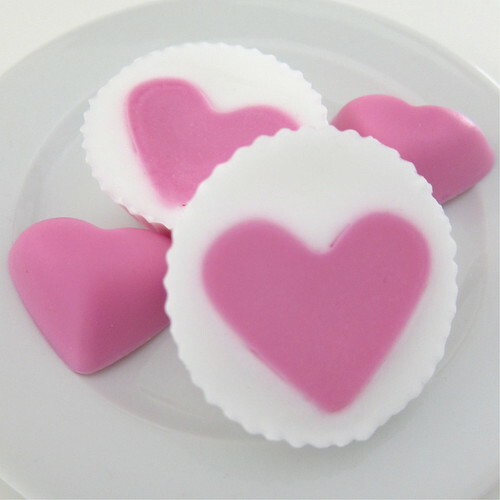 I am very envious of your valentine soaps, they are lovely. I am now sewing, and not to bad at that! Think I’ll just stick to the things I do best. I hope you have a wonderful valentine and just wanted you to know how precious your soaps and wash cloths are. I can’t wait to try these molds. Ihave made soap by keeping all of my soap scraps, than buying some Ivory or Dove soap at the dollar store. I grate all of the soaps in a bowl. Then I pour in some crushed oatmeal, and some Olive Oil. I add scent and a bit of food coloring. Mix in a few teaspoons of water just until it all sticks together. You can use molds, or roll them in a ball and then flatten them so they are about 2″ across and 3/4″ high. I set them on a cookie pan covered with wax paper and let them dry, turning them a few times a day. It usually takes three days or so for them to dry completely. This makes such a great lather, but yet is so gentle. This gives me the soap I need for the year, and enough to give away for birthdays or Christmas. I make a few wash cloths (crocheting), add in a nice hand soap, and a scrubby, a couple of Lumenaries, and some dollar store bubble bath, and put it all in a basket with a bow. Everyone loves them. 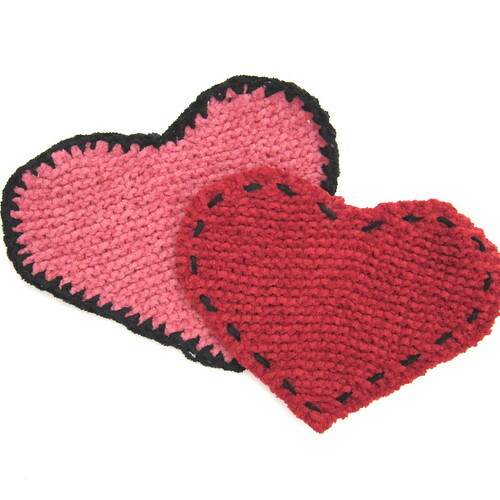 I will have to try the heart washcloths! I was wondering if one could melt regular soap rather than having to buy more ‘craft supplies’! I like to reuse or recycle if at all possible. I’m going to give this a try for valentines. I guess I’d still have to buy coloring if I want pink hearts tho! Don’t know of any inexpensive soap that’s pink. You know, I have no idea as I’ve never tried it, but I don’t see why you couldn’t remelt soap. Buy a cheap bar and give it a try. 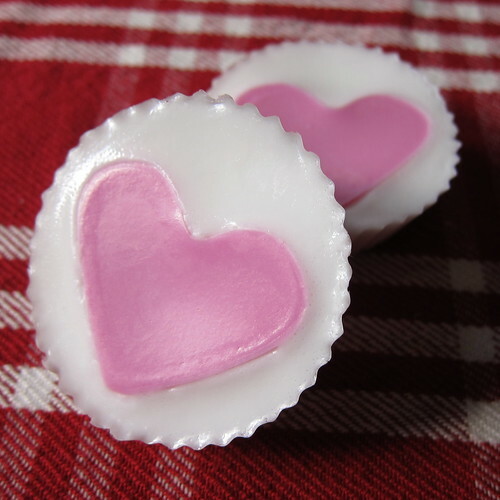 EVEN EASIER: I poured soap base into my silicone cupcake liners, let set a minute, THEN pressed heart into top of cupcake the depth and edge I wanted!! Works great!! This is a very cute idea and perfect to give as gifts! Really Charming! Not sure I could tackle it though. Very nice …I wanna try making these! The soaps are so cute! I’m going to try & make these for all my lady friends! Really like the idea. I have two grand-daughters ages 7 & 9. They stay with me a lot.I do crafting and they are both learning fast. Their father passed away this last summer so I try to keep them busy when they come over. We have a lot of silicone ice trays because we made a lot of gummie candy with jello this past year. We have more than one tray of duplicate shapes. I wouldn’t want to use the soap trays for candy. When they were younger I opened a bank account for them. They have made great friends with all of the tellers. The girls always try to bring something to the tellers (flowers, candy, doughnuts, crafts) each time we go. This soap will be a great gift idea for the girls to bring them. I am trying to teach then kindess and generosity. Jel-low Gummies recipe I made up is really simple. Mix all together, put in a 4 cup or more microwave bowl, cook for 3-4 minutes stirring every minute or so. It will boil and get foamy. Just keep on stirring the bubbles down. Pour into silicone molds. Let set till firm. You can put in refrigerator to hasten progress. If you leave them set out to air dry them for a little while they are firmer. They usually don’t last that long. Yeah, I think it is a good idea to keep soap trays for soap & candy ones for candy. Though you do wash the candy ones with dish soap…so maybe not. Thanks for the recipe! These are so cute! Unique gift idea! Who needs Chocolate! I have never made soap, but I am going to try these! Thanks! I bet you could do similar things for St. Patrick’s Day and other holidays!!! Oh yeah, you can really do any shape. I’ve found some great mold in the candy and cake making department at the craft store. enter me in give away,could not figure out out to enter. I will let you know how they turn out. The giveaway was in 2012, so it is no longer happening. These are really pretty. I am seriously thinking I need to make them. I find making soaps like this is so easy & fun.